Hello! This is Gigaster, today we'll have a sneak peak to the upcoming NBA 2K15. We know that the NBA 2K franchise is the ultimate basketball simulation experience. It features Kevin Durant of the Oklahoma Thunders on the cover. 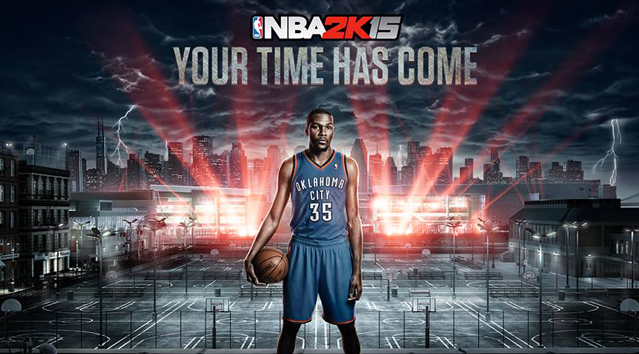 The NBA 2K15 game was developed by Visual Concepts and published by 2K Sports. There are rumors that there will be a new mode in the game called "My League" it is said that its like " The Association" but with a great deal of improvements. You can either play one team or all 30 teams, now you can control everything that happens in the league. It is said that there add sliders/difficulty in Trade Negotiations, Contract Negotiations, CPU Resigning Aggressiveness, Block Buster Trade Sliders. Players when in free agency can decide where they want to go based on the true goals as a player or money. The good thing about this My League is you don't need VC to make a little roster change. There are rumors that there are 26 body parts that can be injured, I guess they will add injury attributes in "My Player" players can be durable in certain areas of their body. Overall, I wish those mentioned above is real. Can you imagine how fun playing 2K15. I'm really excited about these changes. All we could do now is wait till October. Below are the scheduled release dates. Before I go please subscribe to my blog or leave a comment. Have a good day!